Today is National Public Sleeping Day, not to be confused with World Sleep Day on March 18th. Cats are known for taking short naps and waking quickly to flee a predator or pounce on prey. 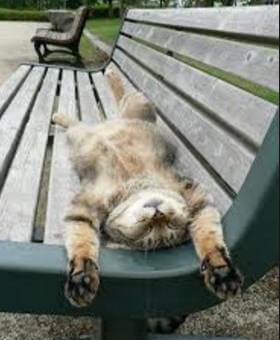 Those who have cats can attest to the fact that cats sleep a lot, an average of 15 hours per day, according to petMD. They are most active at night so, when the bipedal world is getting up, they’re settling in for a snooze. Longer naps have benefits, too, but don’t lend themselves to public situations. For instance, you might miss your stop on the train or bus, sleep through getting fired for sleeping at work or come to on a park bench having unwittingly donated your watch, wallet and shoes while you slumbered. An individual in stage 2 sleep requires more intense stimuli than in stage 1 to awaken. Brain activity on an EEG shows relatively low-voltage, mixed-frequency activity characterized by the presence of sleep spindles and K-complexes. It is hypothesized that sleep spindles are important for memory consolidation. While the effects of caffeine are researched, debated and studied some more—the NIH lists 72 open clinical trials involving caffeine—everyone agrees that a little shut-eye will do you a lot of good. Keep in mind that our circadian biological clock rhythms tend to make us most sleepy between 1 pm to 3 pm. Naps longer than 30 minutes can paradoxically make you feel groggy. This effect is called “sleep inertia” and happens when you awaken quickly from deep sleep. Psychological and motor skills are impaired for minutes or longer, especially if you’ve had insufficient sleep the night before. Dark surroundings will help you fall asleep more quickly and get more out of your downtime. If there’s nowhere at work to turn off the lights and close the door or it’s too cold, hot, rainy or snowy to go outside and lounge with a TPS report over your face, check out the Ostrich Pillow. There’s no better way to let your cubicle mates know they should come back later, get everyone to come look at you, post a photo companywide, worldwide, to the International Space Station, start a therapy fund…or all of the above! 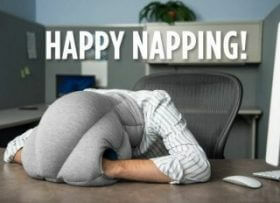 A nap can’t replace a good night’s sleep, but it can sharpen your senses and keep you going until quitting time. 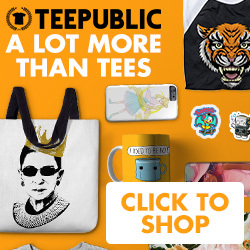 Unless you’re a cat. Then it’s always quitting time. Today is Levi Strauss Day. It celebrates the birthday on February 26, 1829, of the man who invented blue jeans with a little help from his friends. Strauss, born Löb Strauß, grew up in Bavaria, Germany, where he, his family and his community faced discrimination because they were Jewish. They paid extra taxes and were only allowed to live in certain areas. In 1847, after his father died of tuberculosis, 18-year-old Strauss and his mother and two sisters traveled to the U.S. and joined his two older brothers in New York City, where they had opened a dry goods business. He worked there through 1852. He moved to San Francisco in 1853 to capitalize on the influx of miners hoping to strike it rich. The California Gold Rush, begun in 1849 after a nugget was found during construction of Sutter’s Mill, was in full swing. 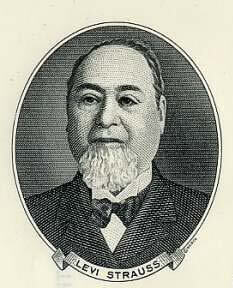 Levi Strauss & Company became a thriving business, selling fabric, clothing and other goods. In 1872, Strauss received a letter from Jacob Davis, a tailor who had found a way to make pants constructed from Strauss’ sturdy cloth even more durable, by affixing metal rivets on the pockets and the fly seam. He couldn’t afford the patent application fee. Strauss covered it and they received the patent the following year. Strauss never doubted their “waist overalls” would be a huge success. They offered two options: pants made of heavy “duck” canvas or blue denim. By 1911, the company phased out canvas altogether. Why did miners overwhelmingly choose what would come to be known as blue jeans? According to Jude Stewart, author of ROY G. BIV: An Exceedingly Surprising Book About Color, it has a lot to do with the dye process.She posted on Slate, “Unlike most natural dyes that, when heated, penetrate cloth fibers directly, indigo binds externally to the cloth’s threads, coaxed by a chemical agent called a mordant. Strauss helped finance the first synagogue in San Francisco and contributed to various charities, especially those benefitting orphans. As his company grew more successful, Strauss was able to expand his generosity even further by funding many scholarships for students applying to the University of California. *You may have noticed the rivet beneath the fly is gone. According to legend, cowboys squatting near campfires got crotch burns when the metal overheated. In reality, it was eliminated due to the World War II mandate to conserve metal. The back pocket rivets were removed in the 1950s after complaints they scratched furniture. Levi’s are arguably the most famous pants on the planet. 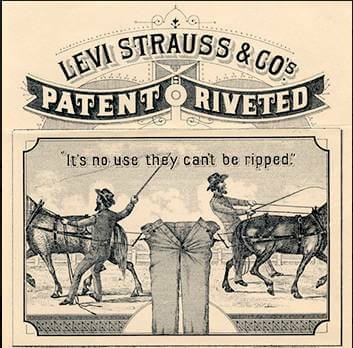 Happy Levi Strauss Day, everybody! Today is International Dog Biscuit Appreciation Day, also known as National Dog Biscuit Day. The modern biscuit our dogs know and love owes its existence to Ohio electrician James Spratt. It gets its international pedigree because he got the idea while on a trip to London around 1860, where he reportedly saw sailors who’d just docked throwing leftover hardtack overboard to stray dogs on the pier, who gobbled it up. 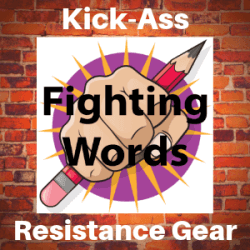 Hardtack derives from British sailors’ slang term for food, tack. Cheap and long-lasting, made from flour, water and salt, it was eaten when fresh food was unavailable, especially on extended 0cean voyages and military campaigns. It was called by other names as well: pilot bread, ship’s bread, sea biscuits, molar breakers and worm castles, due to frequent infestations which necessitated dropping a piece into hot coffee, then skimming off the insects which floated to the top. 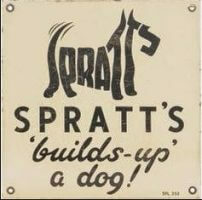 Spratt was already a successful American businessman who had patented a type of lightning rod. While in London to sell them, he seized upon the opportunity to create and dominate a lucrative market that would target wealthy owners of sporting dogs. He formulated his dog biscuits with fresher ingredients than sailors and soldiers enjoyed: meat, vegetables and wheat. He op ened a factory there and began an unprecedented advertising campaign, using large colored billboard displays which depicted a Native American buffalo hunt, implying it was the source of the meat in “Spratt’s Patent Meat-Fibrine.” The true origin remained a closely guarded secret; after selling the company, Spratt retained the sole contract to supply meat for the dog biscuits until his death in 1880. Spratt’s dominated the market until the early 1900’s when a biscuit made of waste milk from slaughterhouses and fashioned into the shape of a bone rose to prominence. It eventually became known as Milk-Bone and captured the imagination of dog owners everywhere. In 1931, the National Biscuit Company, now known as Nabisco, bought the formula. 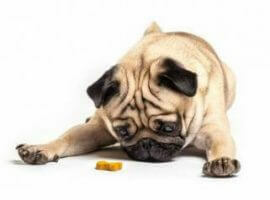 In recent years, as health problems caused by obesity have become more prevalent due to a rich diet, dog treat and food formulas have evolved and more nutritious options are available. There’s no doubt that dog biscuits have come a long way and deserve a little recognition. So give your pooch a big hug and have a happy International Dog Biscuit Appreciation Day! 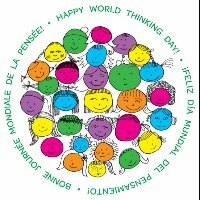 Today is World Thinking Day. It doesn’t mean we get to lay off thinking the rest of the year. It doesn’t mean the Earth is a sentient being. What is it? Read six (very short) paragraphs to find out. In 1899, Robert Baden-Powell wrote a field manual for fellow British soldiers called Aids to Scouting. The following year, he was declared a war hero for his bravery in conflict and the book became well-known. It was especially popular with boys, who staged elaborate games based on his instructions about observation and tracking. After learning of this, Baden-Powell formed the Boy Scouts in 1907. The next year, he published Scouting for Boys, a guide stressing the importance of good deeds and morality. He set up a central office, which registered new Scouts and designed a uniform. By the end of 1908, there were 60,000 Boy Scouts. In September 1909, 10,000 Scouts attended the first national Boy Scout rally at Crystal Palace in London. Many girls showed up, claiming to be members. Baden-Powell founded the Girl Guides, also known as Girl Scouts in many countries, as a separate entity in 1910, eventually appointing his wife Olave to run it. The Girl Scouts held its first conference in Oxford, England in 1920. 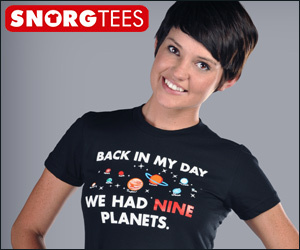 It was held every two years until 1954 and every three years since. The 36th World Conference is scheduled to take place in Tunisia in 2017. At the fourth World Conference in 1926, delegates met at Camp Edith Macy in Briarcliff Manor, NY, a facility owned by the Girls Scouts of the USA. Participants decided to dedicate a day to thinking of their counterparts around the world and expressing thanks to the organization that brought them all together. They called it Thinking Day and chose February 22 as the date for its annual observance because it was the birthday of both Robert Baden-Powell and his wife, Olave Baden-Powell. It’s since become known as World Thinking Day and millions of girls celebrate it. Is all this new knowledge making you crave some cookies? There’s an app for that. The Girl Scout Cookie Finder is available on iOS and Android. Who says history can’t be delicious?